We have couscous salad every Easter to accompany the grilled leg of lamb. It is nice and light and a favorite with the children in the family. I previously posted a summer version with apricots, blackberries, and balsamic vinegar. This recipe has tomatoes instead of summer fruit. The variations could include adding different herbs or citrus, cheese, beans, grilled meat, or other vegetables. I like to make the salad the day before I intend to serve it, since the flavors improve as it chills. In a 2-quart saucepan combine stock and butter. Cover and bring to a boil on medium high heat. Once the stock is boiling, stir in couscous. Mix quickly with a fork, then cover and remove from heat. Let sit 5 minutes. 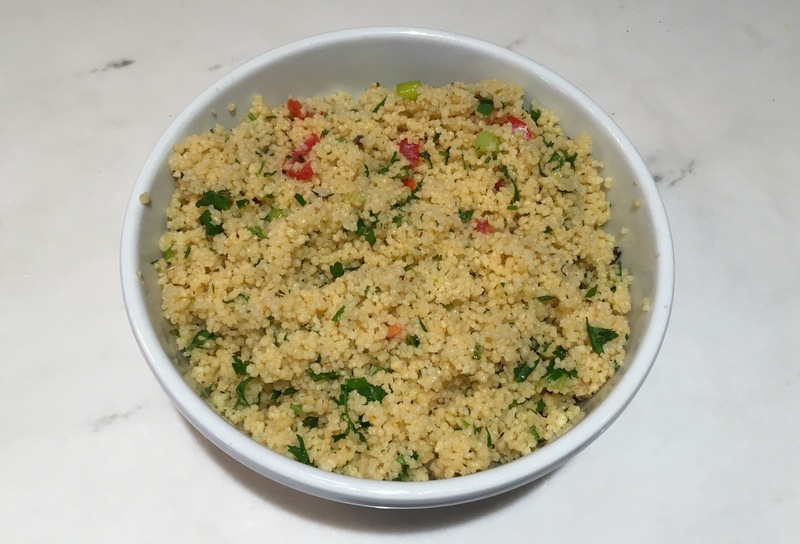 Use a fork to fluff the couscous and pour into a large bowl. Add the remaining ingredients to the couscous and stir to mix well. Taste and adjust lemon juice, herbs, and salt and pepper to your liking. Chill until ready to serve. Serves 6-8. This entry was posted in Dairy-free, Easter, Grains, Pasta, Salads, Vegetarian. Bookmark the permalink.